In this solo exhibition, Juliet Best shares her love of New Zealand through a series of new paintings. Each work reflects her deep gratitude for our 'Beautiful Earth' - her art is the visual expression of her love for her family, her life and her home. Growing up in Lower Moutere, Juliet has a deep respect and love for the Nelson/Tasman region. She recalls fondly how her father authored a book on his birthplace in Appleby, recounting the history of Nelson's 'Best Island', which was named after his pioneering great-grandparents. For this reason, several works in the exhibition feature Nelson/Tasman & Marlborough landscapes, as places she holds near and dear. In this solo exhibition, Nelson-based artist, Caroline Bellamy, captures the essence of New Zealand's landscape; the colours, textures, light and the evident beauty of the land. Energetic, thick, bold brush marks depict the naturalistic forms. Simplification and exaggeration of the landscape characteristics communicate emotion and give the work a sense of spontaneity while a complex use of colour creates an emotive atmosphere and strong sense of depth. From the valley rivers up to the mountain top alpine tarns, Caroline, a passionate tramper and mountaineer, tramps into these remote areas (often long multi-day trips) directly experiencing the landscape. She then translates the energy of the landscape by becoming physically involved with the paintings, using her full arm-span and bodily movements in the brush flourishes. The large scale gives the painted landscapes a greater sense of space and scale and places emphasis on the large weighty land masses. The title of this show, The L Word, was used to highlight the complex mix of derogation and affection that the arts sector has with the subject-matter of ‘Landscape’. In much the same way as photography is inundated with 'amateur experts', the arts industry has been flooded by 'landscape painters', filling the genre with artworks that range from the mediocre to the sublime. In The L Word, a diverse group of artists have taken aspects of landscape as their starting point and infused it with their own brands of abstraction, politics, form and fashion. The show doesn’t try to turn landscape on its head (well, Natchez Hudson might!) but rather presents several examples of just how indefinable ‘landscape’ has become. The exhibition opens at 5.30pm on Thursday 13th September and runs until Monday 15th October. Many of our exhibiting artists will be at the opening, so please come along to meet them. Larisse Hall and Klaasz Breukel have reflected LUMEN within their respective art practices. Klaasz Breukel will be utilising the physical gallery space with projection onto the gallery windows, and has created two significant original works using mixed media on sand-blasted window frames. Larisse Hall's sculptural works use form and colour resonance to quantify 'mood'. Embodying society's cultural rhythms and celebrating our inherently gregarious nature, she encourages awareness around something, that we often simply take for granted. David Carson lives on a small family farm, near Tapawera in the Motueka River Valley. Growing up in a farming family, his father, also called David, had a keen interest in woodworking and joinery, eventually rebuilding their family home with his own hands. His son, David, would always be found in the workshop, honing the skills which he now uses in his sculptural practice. David’s materials are largely sourced from his own rural property (such as the Elm tree, which was “just in the wrong place”) and he processes these materials with a minimal approach where possible. The history in each piece of wood is often reflected in the finished sculptures. As well as being the title for the show, ‘Sleepwalking’ is the namesake work in this new exhibition, which loosely resembled a pair of legs when it was milled. 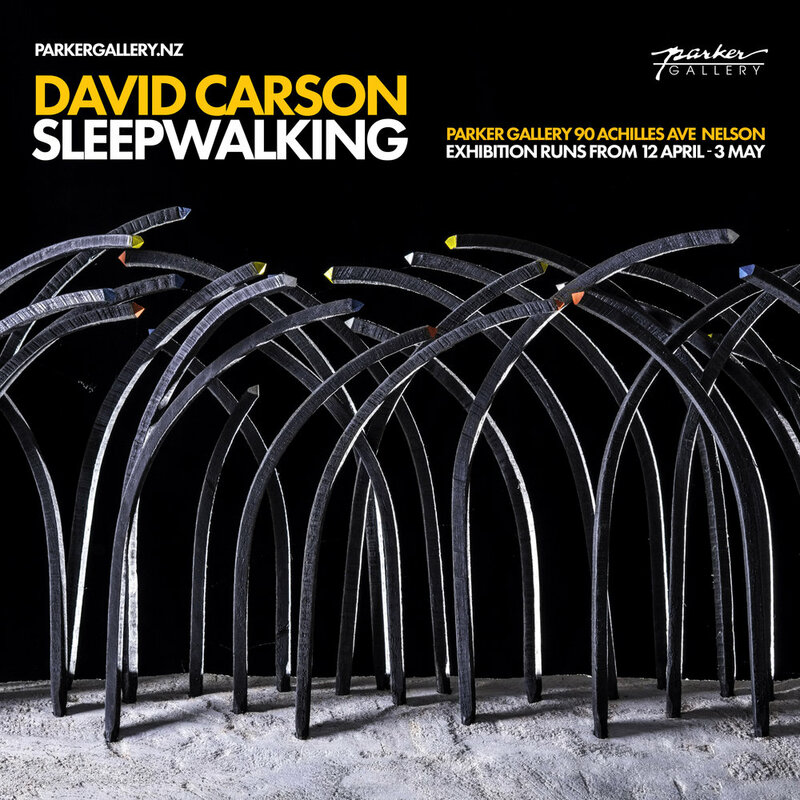 In ‘Sleepwalking’ David continues to push the boundaries of contemporary sculpture, applying the logic that once you know the rules, you can break them. Spending her time between Germany and New Zealand, Lisa Chandler combines her two homes in 'Traces of the Past'. In her upcoming exhibition, Lisa explores local Nelson images using a 'trace monoprinting' technique, including abandoned buildings, doorways, windows and historic portraits from the Tyree Collection. The exhibition is itself an installation, with new paintings added each week to culminate in a total of 50 small works. The German practice of a finissage (or closing party) will mark the conclusion of Traces of the Past on Wednesday 21st March at 5.30pm. Wednesday 28th February (12 paintings), Wednesday 7th March (24 paintings), Wednesday 14th March (36 paintings), Wednesday 21st March (50 paintings) including the Finissage / Closing Party - 5.30-7.30pm. Time & Tide is a joint exhibition featuring new work by glass artist, Lynn Price, and ceramicist, Sue Scobie. Both artists take their inspiration from the surrounding landscapes of the Nelson/Tasman region. 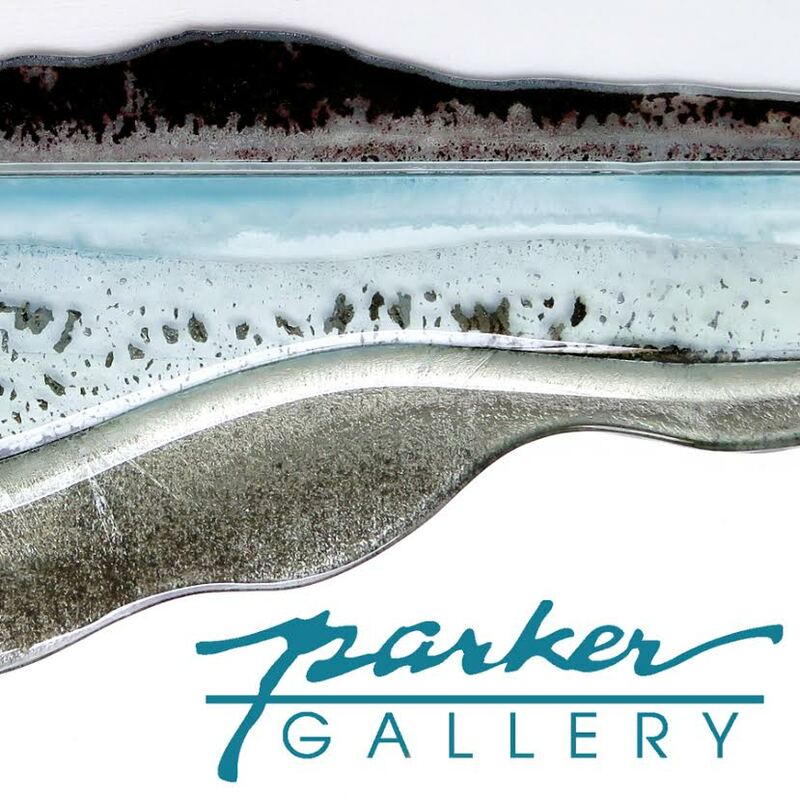 Working primarily with kiln formed glass and metals, Lynn Price combines her expertise in glass with her mutual interests in drawing, print and textiles, to create highly original artworks which are clearly informed by her love of the raw material. Sue Scobie takes her inspiration from the colours, forms, sounds and textures of the land and sea. Elegantly contrasting silky, translucent porcelain with unglazed stoneware, her vessels capture both the essence of wild places and a sense of quiet contemplation. Aqua Ingravitas is an exhibition by Nelson-based underwater photographer, Jose G. Cano. The show features photographs and a video installation which is the result of his collaboration with outstanding contemporary dancers from New Zealand. His exhibition of large scale photographs is a reversion of the accepted path, from the conceptual to the form. Jose first lets the form emerge as a realisation of the Archetypes that populate his reality, his mind and his life. He silences his thoughts and lets the form appear and take a life of its own. Isolated from the world, in silence and darkness, these pure forms manifest themselves; serendipitous, unrepeatable, freed of the confusing and chaotic environment of our lives. Aqua Ingravitas acknowledges the visual and aesthetic Catholicism of Jose G. Cano's childhood, the time passed in Baroque churches full of angels and saints, of Madonnas and goddesses, the Renaissance bodies telling mythical stories of humanity, dreams and fears. Following a two-year hiatus, Dan Campion aimed to create works for his exhibition “I’d Rather Go Home Hungry” that explore avenues of pure graphic representation and formalism with no personal shadow or narrative cast. He wanted the typical ‘self-invested’ narrative to take a back seat to a hard-lined, conceptual and graphic series of paintings. He was hoping to question the role of the artist using the process of a mechanical approach. However, after a while he started to ask whether it was possible to prevent the artist’s mundane and everyday dramas from permeating its way, invited or not, into the finished work. Campion explains, “With the content resolved through the formal confines of the methods I’ve employed, I’ve asked questions along the way such as how present does the hand of the artist need to be, to be considered a work of art, and where does the distinction lie between the art and craft dichotomy.” Regardless of his original intention, in 'I'd Rather Go Home Hungry', Campion presents some of the most personal work he has achieved to date. Various fibres have been worked to produce artefacts which conjure memories of childhood stories, while thread in its simple form is grouped and scanned to produce imagery which embraces the natural properties inherent within. An installation of thread and rock responds directly to the specific space, showing thread in multiples punching well above its weight. The use of a line en-masse follows on from previous studies, only this time with the use of colour. Although Yellow Yellow is all overtly all about yellow, the adherence to only yellow and black in essence still offers a monotone palette. At this time of year, Yellow Yellow is intended to be an injection of visual Vitamin C.
By transforming plastic waste into attractive sculptural artworks, I highlight the huge amount of plastic that is used in today’s society and the fact that most of this material ends up polluting the environment or is buried in landfill sites. It is time to act and demand that plastic use be severely reduced. Linda Weintraub, artist and theorist, is of the belief that artists are in the privileged position to highlight issues that are threatening the sustainability of the environment and to put pressure on governments to make the necessary changes in order to improve the health of our planet. Colourful? Quirky? Beautiful? You decide. However, collectively, it is time to make a stand. The lifesaver is you.